Explore the most popular software utility sections, setup the fresh editions of the popular programs, and test free! The greatest downloads for computer and cell devices. Tools, free programs, applications, and demo programs, joined into specific categories are at the solution. Software downloads from SoftEmpire directory bring you good systems and apps for your notebook or digital gadgets. Basically utility solutions are free, so you may not only make better the laptop with the latest software utilities, but also save time! Download free utility software from the widely known Internet catalog! System software planned to help examine, configure, improve, and maintain the computer. Hard drive utility tools for laptop health and PC wealth. Windows utility software tool collection to assess, structure, and improve the activities of the computer. 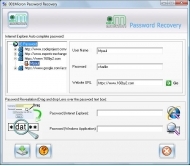 IE password recovery software is a comprehensive solution for recovering all Internet Explorer saved password along with any password protected Windows application records. Enhanced password restoration utility securely restore all lost, forgotten internet explorer saved passwords used for online shopping, web forms, email id, newsgroup accounts, magazine subscription etc within seconds that supports multilingual password recovery of any Gmail, Orkut, Yahoo, Rediff, Facebook, AOL, MSN accounts etc. All versions of MS Internet Explorer are supported by professional password unmask software which easily uncovers high strength password hidden behind asterisks. Advanced password revealer software support recovery if all FTP passwords, IE Auto Form and AutoComplete fields, database files, PDF, ZAR, ACE, ZIP archive passwords and facilitate users to save the recovered password at specific location on PC that can be used later when required. Powerful IE password retrieval application has good looking user friendly graphical user interface and no professional knowledge or experience is needed to work with password recovery software. Software supports all Windows operating system including 98, ME, NT, 2000, XP, 2003, Vista and all IE versions. * Recover lost, forgotten, misplaced passwords from internet explorer and unmasks all Windows applicationâ? ?s passwords. * Support recovery of passwords created for web mail accounts, files, folders, documents, directories etc. * Facilitate instant password retrieval of FTP accounts, online shopping, magazine subscription, news group, search engine accounts etc. * Easy to use graphical user interface is provided with the internet explorer password rescue software to operate it in the easiest way. PC activity logger runs in stealth mode and records every detail of pc and internet activity at your office or home. Advanced Keylogger software can record chat conversations, keep eye at emails and even watch the sites user surfed to.